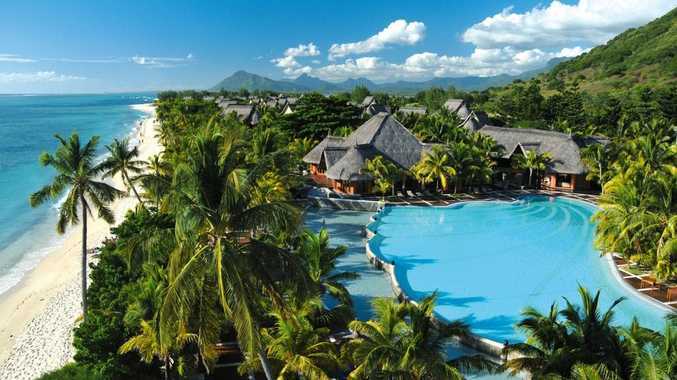 STAY in a stunning five-star luxury resort on the beautiful tropical island of Mauritius and save $1070 per person off the price of accommodation, with Travel Associates. Travellers will stay at the beautiful five-star Dinarobin Hotel Golf and Spa for six nights, saving 30 per cent off the price of accommodation (per person, twin share). Stylish and sophisticated, the all-suite Dinarobin Hotel Golf and Spa is nestled in a tropical garden at the foot of Le Morne mountain and edged by a spectacular lagoon. This beautiful all-suite resort features a stunning Spa by Clarins, six pools, free water and land sports plus four restaurants. Guests can also access the four restaurants at sister resort, Paradis next door and access the 18-hole championship golf course. The deal is priced from $2495* per person twin share and includes six nights in a Junior Suite including a 30 per cent discount off accommodation rates; Hot English buffet breakfast daily; dinner with a choice of restaurants; free water sports, including water skiing; and nightly entertainment. The offer is available for sale until February 29, 2012, unless sold out prior, for travel between March 12 and March 18, 2012. For more information visit Travel Associates.